Skip the small talk. For quick answers and easy updates, start supporting your customers with Text, a new feature of Zendesk Talk. The moment a customer texts you, their message automatically becomes a ticket in Support. From there, agents can apply macros, triggers and other business automations to respond quickly and easily. Sometimes the best defence is a good offence. Get ahead of support issues by sending proactive messages, or create triggers for automated notifications and alerts. Text, a feature of Zendesk Talk, is built into the Zendesk Support ticketing system. Teams can get started in minutes — no need to hire developers or an implementation team. Text is an absolutely indispensable part of our support strategy. 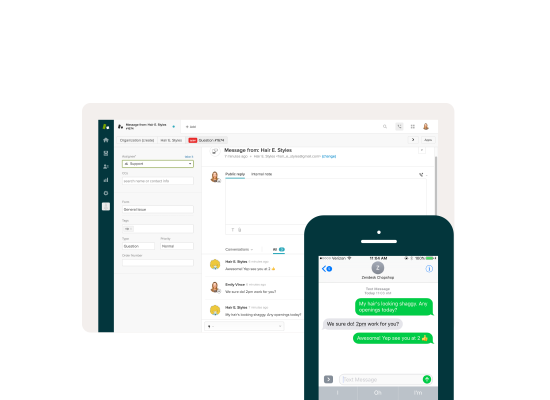 And with the Zendesk family of products, we have all our support channels, including email, phone and text, in one place. Already have Support? Take a look at Talk.